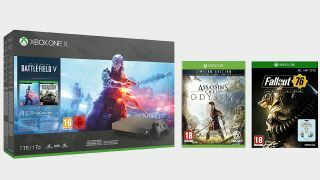 Get an Xbox One X, Battlefield 5, Battlefield 1943, Assassin's Creed Odyssey AND Fallout 76 for £399.99. Wait, what? I mean, how much do you want in one bundle? This Xbox One X 1TB Gold Rush console comes with Battlefield 5, Battlefield 1943, Assassins Creed Odyssey AND Fallout 76 for £399.99. That's a Xbox One X and four games for less than £400! Those are the special editions of Assassin's Creed and Fallout 76 as well. That means that Assassin's Creed Odyssey comes with several DLC weapons, while Fallout 76 some with S.P.E.C.I.A.L. pins for Strength, Charisma and Luck. And, if you're not a Battlefield fan then there's a Forza Horizon version. You get one less game but still take away those Assassin's Creed Odyssey and Fallout 76 special editions. Bar-gain.